Mexico’s Riveria Maya is home to sugar sand beaches, vibrant coral reefs, freshwater sinkholes (called “cenotes”) and Mayan ruins. On this half-day private tour, guides bring you to a Tulum beach for a boat ride to several temples and a reef snorkel amid turtles and stingrays. 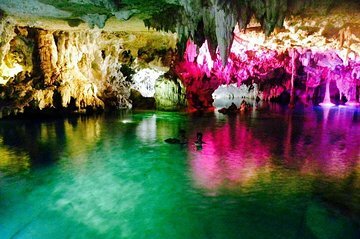 Later, you’ll swim in a beautiful cenote, with its otherworldly caves and clear water. Hotel pickup and drop-off: Extra charges apply for pick-up from Cancun to Puerto Morelos.